Our selection of beautiful wedding venues in Buckinghamshire suitable for accommodating a marquee for a wedding. Nether Winchendon House is timelessly enchanting and fabulous. This venue is absolutely unique and perfect for a truly romantic day and wonderful photographs. An enchanting location for a Marquee Wedding is The East Lawn, surrounded by rustic walls and old fashioned English flowers. The Walled Garden is smaller and more intimate and particularly suitable for weddings in the winter months. 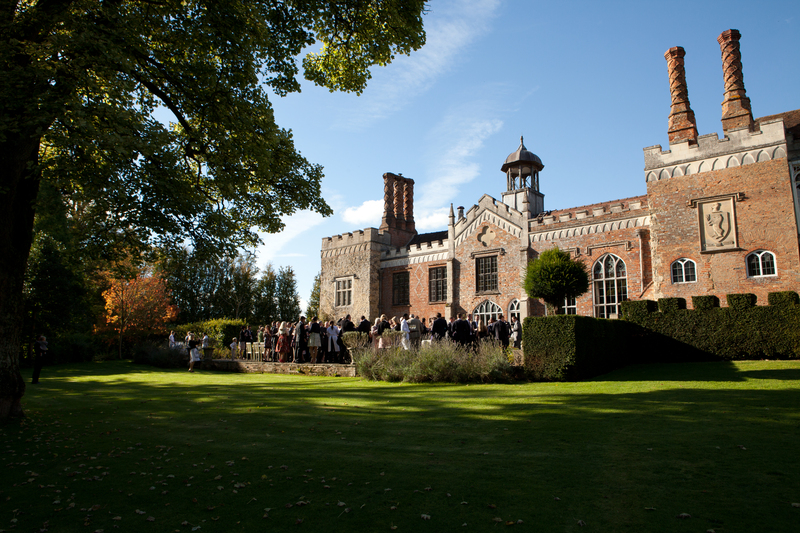 A marquee reception can be held in the stunning formal gardens for up to 250 people. Guests can enjoy an exclusive viewing of the manor before champagne on the terrace. The buildings and grounds here are impossible to parallel and provide an impressive array of variation to suit almost any desire that you may have for a wedding; whether it be through a traditional church service or a civil ceremony in the Mansion. Without doubt one of the lovliest wedding venues in Buckinghamshire. The Dairy nestles in a tranquil waterside setting amidst glorious gardens offering a haven of peaceful tranquillity where total exclusivity is guaranteed for a wedding. Breathtakingly beautiful, with architecturally elegant rooms, roaring log fires in winter and a wide terrace with two pavilions projecting out into the lake perfect for shaded summer drinks receptions. The Dairy offers a wonderfully romantic backdrop – whatever the season. Marquees over the central courtyard are ideal for couples wanting a wedding reception for between 110 and 200 guests, subject to availability of dates. There is no typical wedding at the Five Arrows, but to every single event there is a sense of understated elegance and ease. If there is something that you imagine as part of your day, let us know and we will do our best to make it happen. The Grade II listed Five Arrows is licensed for marriages and civil partnerships, so you can enjoy the whole of your perfect day on site if you choose. We offer exclusive use of all the rooms, the restaurant, gardens and Old Coach House so you can celebrate with your nearest and dearest in this unique boutique hotel. The Barn at Chilton is an 18th century vaulted barn conversion creating a stunning setting for all types of meetings, conferences, events and private functions. Located on the historic Chilton Estate the stunning views of rural Buckinghamshire and the lake can be enjoyed from the terrace. The marquee is positioned on one side of The Barn with access through French doors (surrounded by large windows) which allows guests to sit and talk in comfort, slightly away from the noise of the music but still very much part of the celebrations. Whether you decide on a small and intimate service or a large glamorous event, the 15th century Mansion nestled in idyllic rolling countryside offers a stunning backdrop against which to capture beautiful memories of your wedding in Buckinghamshire. A marquee extension on South Lawn can accommodate up to 130 guests for a sit down Wedding Breakfast, or 200 for an standing party. Or have a marquee in the grounds. With 30 acres to choose from, the choice of location is yours, whether it be hidden in the magical walled garden, somewhere on the Front Lawns or on the North Terrace, you decide.